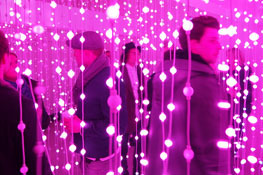 Submergence is a large, immersive walkthrough experience. It uses up to 8,064 individual points of suspended light to create feelings of presence and movement within physical space. The installation transforms space into a hybrid environment where virtual and physical worlds coincide. As you enter the piece, you walk into a space occupied by both real and virtual components, both of which you can affect. The piece is divided into sections that gradually increase in tension, building to a final climax. Each section has its own elements, atmosphere, and responsiveness. People socializing while interacting with Submergence.